DANCE IS THE HIDDEN LANGUAGE OF THE SOUL!! On the occasion of World Dance Day Wittians enthusiastically tapped their feet and enjoyed the Zumba dance along with their teachers. Students were also briefed that every year April 29, is celebrated as a World Dance Day through the promotion by the International Dance Council (CID), an umbrella organization within UNESCO for all kinds of dance. Reading has at all times and in all ages been a great source of knowledge. Today the ability to read is highly valued and very important for social and economic advancement. In today’s world with so much more to know and to learn and also the need for a conscious effort to conquer the divisive forces, the importance of reading has increased. In the olden days if reading was not cultivated or encouraged, there was a substitute for it in the religious sermon and in the oral tradition. In the nineteenth century, Victorian households used to get together for an hour or so in the evenings and listen to books being read aloud, But ,today we not only read, we also want to read more and more and catch up with the events taking place around us. Reading has several advantages, therefore D.E.A.R. ( Drop everything and read) activity was held at WIS, Atun Road, Bhilwara on Friday, April 28,2017. Students brought their favourite books for the activity. It was an amazing session where all the students and teachers had pleasure reading for 20 minutes. We all possess a potential and passion to dance; there is a vitality, a life force, an energy, a quickening that is translated through us into actions and this expression is unique. And if we block it, it will never exist through any other medium and it will be lost. The world will not have it. There is only a queer divine dissatisfaction, a blessed unrest that keeps us marching and makes us more lively than the others. The world of entertainment today has been greatly influenced by song and movement. Dance forms such as ballet, tap, jazz and hip-hop have been performed in royal courts also. Keeping this in minds International Dance Day was celebrated at WIS, R.C. Vyas branch on April 26' 2017. Students of Grade 4 gave information about the dance and dance forms. The principal addressed the gathering and had a quiz for the same. She also encouraged students to get involved in dance during these summer vacations. Wittians of Sr. KG enthusiastically participated in Show and Tell Activity based on theme of season. Children brought pictures of different seasons and spoke few lines about it. They keenly observed all the objects related to different seasons and listened to the views about them. Through this activity they learnt about all the seasons the food and clothing related to the seasons and the activities that can be enjoyed in those seasons. Puppets are both entertaining and captivating. Children can believe and relate to them, they can enter and explore the fascinating inventive world that puppets create. 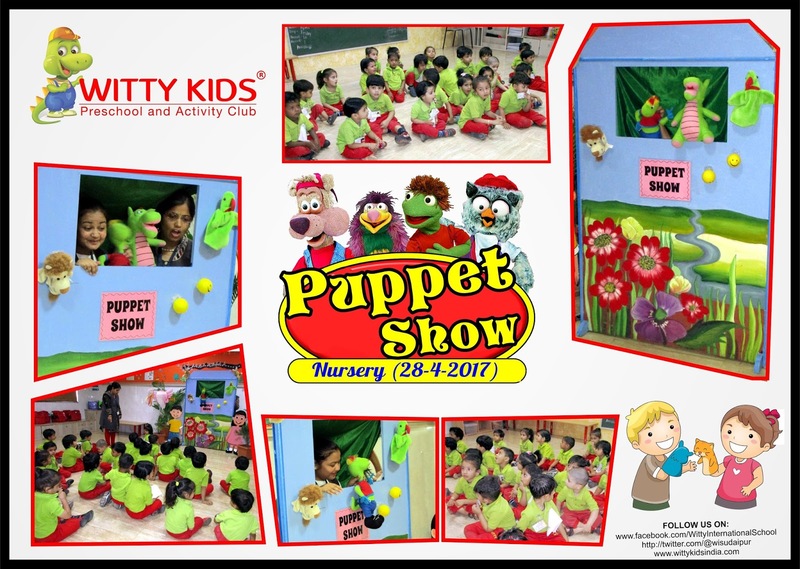 On 28th April, 2017 little Wittians of Witty International School, Udaipur witnessed a puppet show. 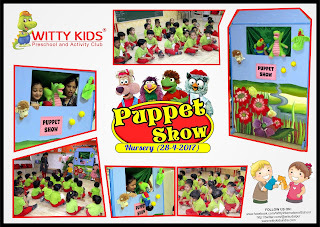 Through the puppet show “Witty gets ready for school” the teachers taught them importance of school life. During the initial phase of school life the children are reluctant and they cry while coming to school. But as the time progresses they start enjoying it. Children were taught multiple lessons like sharing, helping each other, playing together etc. They were surprised and excited to have a Witty stamp on their hand. It was a fun frolic day for little toddlers. Sure, it’s fun to share a good laugh. Laughter is a strong medicine. It draws people together in ways that trigger healthy physical and emotional changes in the body. Laughter strengthens our immune system, boosts mood, diminishes pain, and protects us from the damaging effects of stress. By seeking out more opportunities for humour and laughter, though, we can improve our emotional health, strengthen our relationships, find greater happiness—and even add years to our life. Hence, a very entertaining Laughter session was conducted by Mr Devendra Parik at WIS Atun Road,Bhilwara on Friday, April 28,2017. He believed that laughter is a powerful antidote to stress, pain, and conflict. Nothing works faster or more dependably to bring our mind and body back into balance than a good laugh. 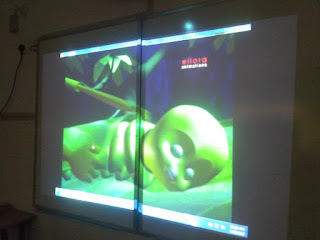 He made students do few laughter exercises, which made the environment really happy. Students were very happy with the different techniques of laughter taught to them. Teachers too joined the laughter session. At the end Sir Principal thanked the guest, Mr Devendra Parik for the amazing laughter session. Good penmanship is more than just a quaint skill. Jotting down a shopping list, writing a birthday card, taking down a phone message, completing a form at the bank ….handwriting is part of our daily lives. It is on show to others and may be used to make judgements about us. Keeping the objective of Handwriting in mind English Handwriting Competition was held for the students of Grade I to VIII at WIS Atun Road, Bhilwara on Wednesday, April 26, 2017 .The criteria for judgement were taken as formation of letters, spacing of letters, no omission of letters, spellings and overall presentation. All the students participated with great zeal and enthusiasm in the competition. The Little blossoming faces of Nursery class of Witty International School, Udaipur came beautifully dressed in the costumes of Mary, Lamb and School Kids. As today was the rhyme enactment of Mary had a little lamb. It was a fun frolic day for the toddlers of Nursery. 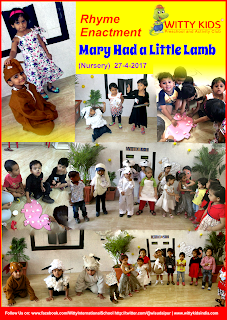 The class was decorated with beautiful cutouts of Mary, School and Lamb. The little ones enacted the rhyme and did an activity of sticking cotton balls within the large lamb cutout. Children enjoyed the activity very well. Live green, love green, be green. We are just mankind…without the earth we are nothing. Inspirational Movies make us laugh, make us cry, and they make us think. But mostly, they remind us why we are alive and what’s worth living for. They remind us that every day, is another day, to get up, venture into the world, and make a difference. 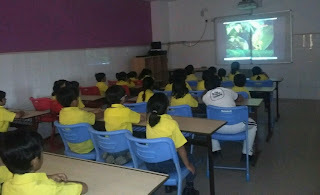 Keeping this in mind Witty International School, Udaipur has organized a movie show for the students of Grade I to Grade V on the occasion of World Earth Day. Students enjoyed watching the movie – My Home is Green and they grasped the important features of life like Respect, Hard Work, Bravery and Adaptation in nature, Sharing, Responsibility, to ignore little diversions and Teamwork. How hot you can be. The wonders of nature you see. 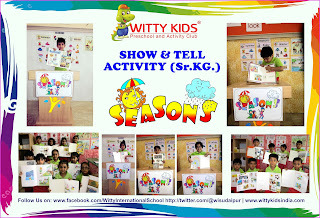 Children of Sr.KG at Witty International School, Udaipur enthusiastically participated in the Show and Tell Activity based on the concept of Seasons. They brought beautiful collage of Winter, Summer and Monsoon Season in their scrapbook and tried to speak few lines on the same. With this activity children initiated to present themselves in front of their classmates and expressed their views. 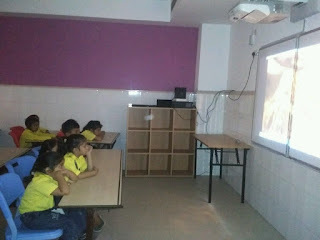 It was a good start for the kids to understand the concept in a more colorful and creative manner. The Little Sports Star Hiral Agarwal of Grade-I A, Witty International School, participated in Skating competition organized by S -Tech Skating School in collaboration with sports hub held on 22nd - 23rd April, 2017 at Bhilwara. The bright Wittian secured Two Silver Medals one in Road Racing and another in Rink Racing skating competition and brought laurels to the school. Witty International School celebrated World Earth Day on 24th April, 2017. Grade VIII students participated in a special assembly with their vibrant and enthusiastic emotions. Scholars started the assembly with a prayer followed by mesmerizing song. Knowledgeable information was enacted through a mime act which was based on the theme “Save Water”. The young Wittians grabbed the attention of the audience through their spectacular dance performance. Principal Ms. Shubha Govil promoted the phrase, ‘Nature always wears the colors of the spirit’. SPLASH ! SPLASH ! SPLASH ! Lets give a big Cheer!! 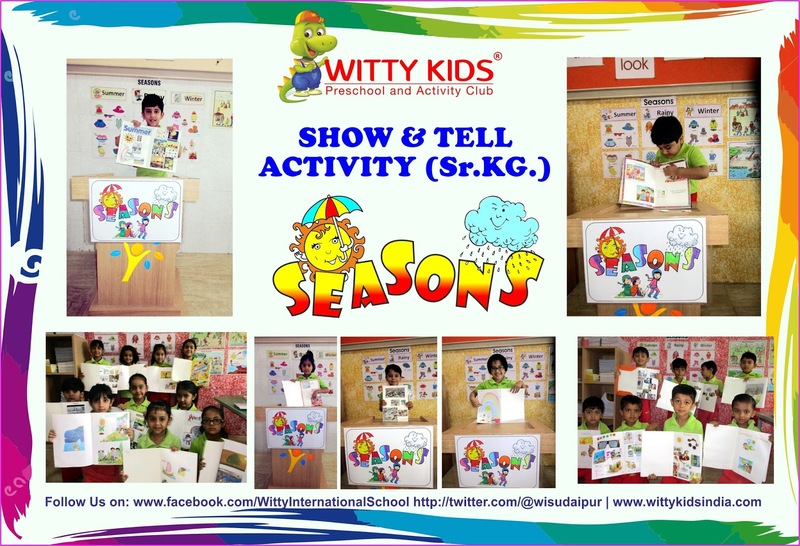 On 24th April, 2017 Little Wittians of Witty International School, Udaipur were introduced to the summer season. Teachers conducted an outdoor activity depicting summer season with the help of a pool, umbrellas, hat, sunglasses etc. Children along with their teachers prepared a refreshing summer drink and enjoyed drinking it in the class. They also tried to stick orange and yellow paper on the sun outline. It was a fun frolic day for Little Toddlers.